All the approaching milestones for the players ahead of the New Zealand-India T20I series. The battle between New Zealand and India moves into the T20I format after the visitors thoroughly dominated the ODI series with a thumping 4-1 victory. Martin Guptill, the leading run-getter in T20I history as on today, will be missing the series due to a sore back while India have rested their regular skipper Virat Kohli. The series will give hope to a few players who are aiming to seal a spot in the World Cup at the last moment. 44 – Yuzvendra Chahal needs six more wickets to complete 50 T20I wickets. Ravichandran Ashwin (52) is the only Indian with 50 T20I wickets so far. If Chahal claimed those six wickets in the next three T20Is, he will be the 2nd fastest to 50 T20I wickets. 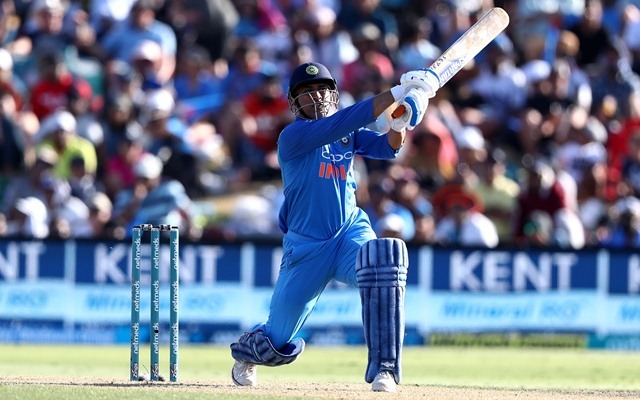 47 – Number of sixes MS Dhoni has hit in the T20I format. Only Rohit Sharma (98), Yuvraj Singh (74) and Suresh Raina (58) have hit 50 and more T20I sixes for India thus far. 98 – Rohit Sharma needs two more sixes to become the 3rd player to hit 100 sixes in T20I cricket. Only Chris Gayle (103) and Martin Guptill (103) have hit 100 T20I sixes thus far. 100 – Colin Munro (97) and Ross Taylor (96) need 3 and 4 boundary fours respectively to complete 100 fours in the T20I fours. Only Martin Guptill (200), Brendon McCullum (199), Kane Williamson (152) have hit over 100 T20I fours for New Zealand. 198 – If Dinesh Karthik features as a wicketkeeper at some point in the series, he will have a chance of becoming only the 4th wicketkeeper to have 200 dismissals in Twenty20 format. Karthik has affected 198 dismissals as a wicketkeeper thus far. 297 – MS Dhoni has featured in 297 Twenty20 matches thus far. He will become the first Indian to appear in 300 Twenty20s if he plays in three more T20s. 990 – Krunal Pandya needs 10 more runs to complete 1000 runs in Twenty20 cricket. He has scored 990 runs in the 68 T20 matches thus far at an average of 26.75 and a SR of 147.54 with two fifties. 4966 – Colin Munro needs 34 more runs to become the 4th player from New Zealand to aggregate 5000 runs in Twenty20 cricket. Among NZ players, only Brendon McCullum (9922), Martin Guptill (6301) and Ross Taylor (5731) have scored 5000+ T20 runs. 15914 – Ross Taylor needs 86 more runs to become the first player to score 16000 International runs for New Zealand. He is also 154 runs away from completing 27000 runs in professional cricket having scored 26846 runs thus far. 20899 – Dinesh Karthik needs 101 more runs to complete 21000 runs in his professional career. He has scored 9376 FC runs, 6416 List A runs and 5107 runs in T20s ahead of the T20I series.